True, a pregnant woman is responsible for eating enough for both the baby and herself to survive, but sometimes that can go a little bit overboard. In other cases, some expectant mothers become afraid of how much weight they have or will gain and restrict their diet. Neither is healthy for mom or baby. This topic is important because of the increased rate of gestational diabetes and lack of communication between expectant mothers and physicians. Telling a woman her weight gain is not optimal for her pregnancy is a hard conversation to have with anyone. After all, the health of your baby starts with you! You can see how your body naturally prepares itself to create and preserve life and in a few ways, that includes gaining weight. This is a widely debated topic but there are some general dietary guidelines to keep you within a healthy amount of weight gain. Let’s first cover what mom and baby use for energy. Carbohydrates are the main source of energy for the fetus. As natural shifts occur in the mother’s body, more carbohydrates are supplied to the baby and the mother relies more on stored fat for her energy. If the mother loses any weight during the pregnancy, the baby is at risk of not getting enough carbohydrates and may have impaired growth and intellectual development. (3) Protein is also needed in extra amounts as it is used to synthesize new maternal and fetal tissues. As stated above, fats are also increased in the blood stream to be used as energy for mom. Surprisingly, only 31% of U.S. women gain weight within the recommended amount. Gaining the proper amount of weight can significantly lower your risk of delivering a low-birth weight baby by about half! Gaining too much weight can lead to a large baby, C-sections, and postpartum weight retention. (5) Many concerns about excessive weight gain during pregnancy have lead to the assumption that it may increase the risk of obesity in children. 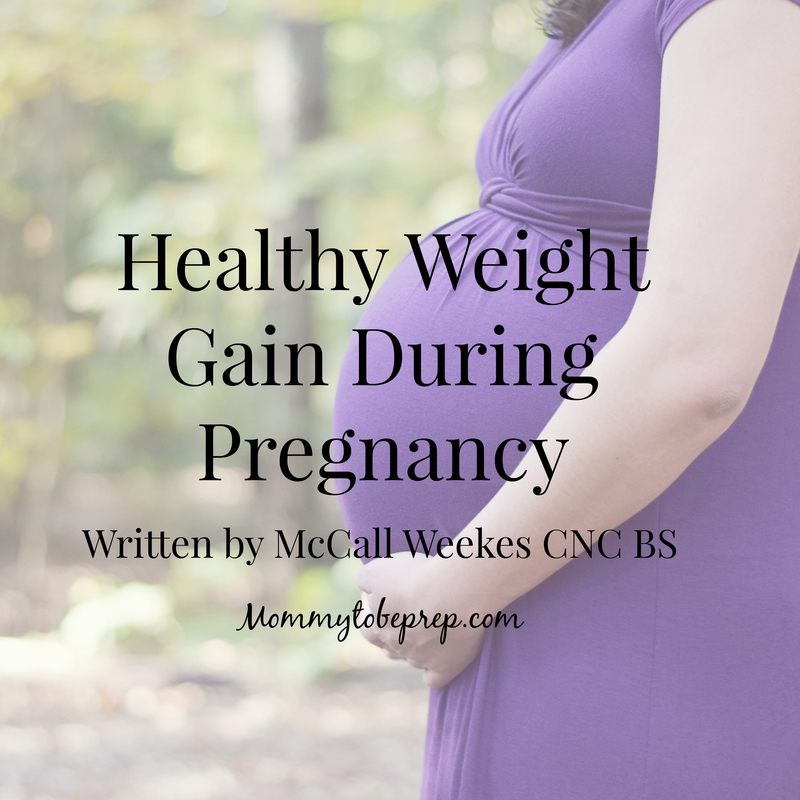 Approximately 3-5 pounds should be gained in the first trimester and then gradual and consistent weight gain throughout the rest of the pregnancy. 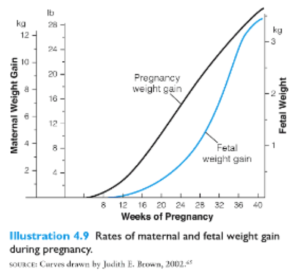 Weight gain may slow down just slightly as the due date approaches. 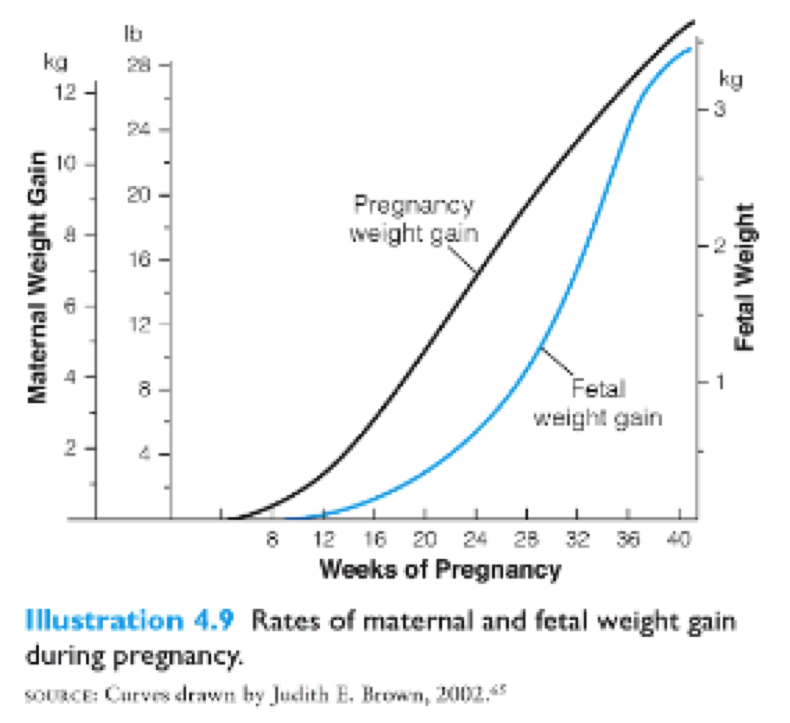 Refer to the graph below for a general idea of maternal and fetal weight gains during pregnancy. There are all kinds of snacks that are 300 calories. What happens to all these pounds if the baby is born weighing in at only 7 lbs? Most of the increased weight is accounted for in the extra tissue mom has accumulated over the last 9 months. As her body is no longer supporting life, that tissue will eventually go away as weight is lost postpartum. Being a mom and having the opportunity to create and support life is a wonderful blessing. Taking care of our body during this process is so important for not only mom’s health but for the baby’s growth and development. If you have any questions about your weight gain during pregnancy, don’t hesitate to talk to your physician. Ask for recommendations from your doctor as to how you can keep yourself on track to give your baby the healthiest start possible. *BMI has been disputed as being a reliable source when determining a person’s weight category. It has proven to be helpful on the two ends of the spectrum, underweight and obese. For the purpose of this blog post, the estimate of BMI will work just fine. McCall Weekes is a certified Nutrition Consultant with a B.S. (Bachelors of Science) in Nutritional Science from Brigham Young University in Provo, Utah. McCall is a private nutrition consultant in the Utah region with a strong online presence including clients all over the world. 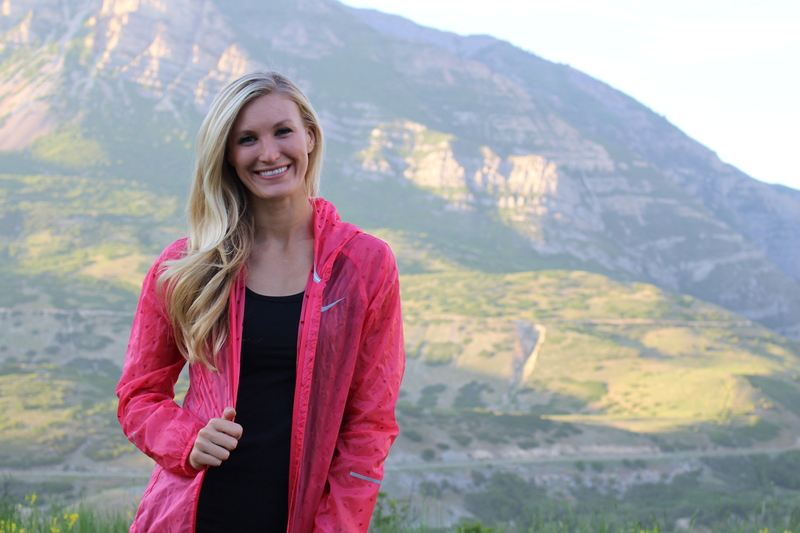 McCall is passionate about helping others change their lives by becoming both mentally and physically stronger. McCall is especially interested in coaching pre and post natal mothers due to their strong drive. She states, “Pre/post natal mothers are some of my favorite clients because they are so willing to change if it means bettering the life of their child. The bond between mother and baby is such a beautiful thing.” Visit anewtritionlife.com to learn more and get %10 off your next service when you mention mommytobeprep! King, J.C. Physiology of pregnancy and nutrient metabolism. Am J Clin Nutr 2000; 71:1218S-25S. Rosso, P. Nutrition and metabolism in pregnancy. New York: Oxford University Press, 1990: 117-118, 125, 150-151. Butte, N. F. Carbohydrate and lipid metabolism in pregnancy: Normal compared with gestational diabetes mellitus. Am J Clin Nutr 2000; 71:1256S—61S. Rosso, P. et al. Intrauterine growth retardation: A new systematic approach based on the clinical and biochemical characteristics of this condition. J Perinat Med 1974; 2:147-60. Hytten, F. E. and Leitch, I. The physiology of human pregnancy. Oxford: Blackwell Scientific Publications, 1971.